If you're already running Windows 8 on you PC, it's free. Go to the Windows Store to update to Windows 8.1. 1.) ... Download and Update Infos for Windows-8.1! 2.) ... System requirements for Windows-8.1! 3.) ... Free update Infos Win 8 to Windows 8.1! 1.) Download and Update Infos for Windows-8.1! For the moment, the update can only be installed on a PC that already have Windows 8 installed. At 18.10.2013 the Windows 8.1 will be available and appears ready in MS Windows Store for download. Here it goes to ... Download Windows 8.1 (Upgrade)! You need adminstrator permission to update to windows 8.1! (Image-1) Upgrade Windows 8 to Windows 8.1 for free (Update)! 2.) System requirements for Windows-8.1! To install the free update to Windows 8.1 or Windows 8.1 Pro through the Windows Store, your PC must be running Windows 8 or Windows 8 Pro. DirectX 9 graphics processor with WDDM driver! 3.) Free update Infos Win 8 to Windows 8.1! If your PC is currently running Windows 8 or Windows RT, it's free to update to Windows 8.1 or Windows RT 8.1. And unlike previous updates to Windows, you'll get this update from the Windows Store. See: Update from windows-8 to 8.1 tutorial! 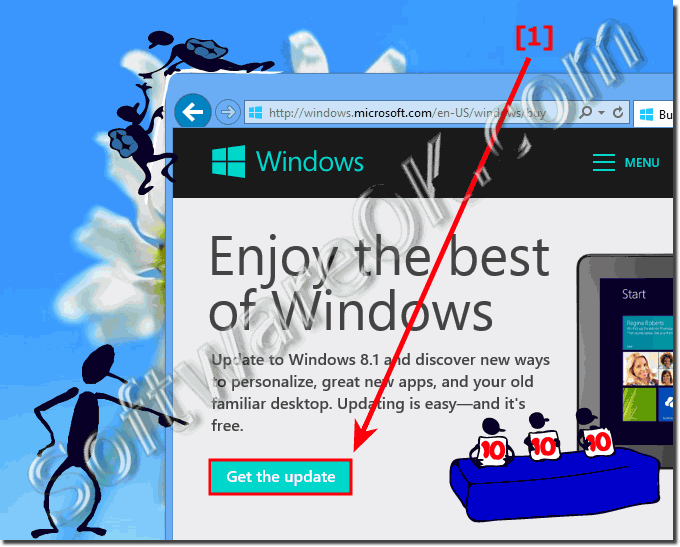 Windows 8.1 update 1 direct download highly compressed? Samsung omnia w 8.1 window? Update win 8 to 8.1 free? Windows 8 Upgrade Free Download? Link to download 8.1 update windows? Free upgrade to windows 8.1 from windows 8? Download windows 8.1 free upgrade? Update windows 8 to 8.1 free? Windows 8 to 8.1 free update? Update to windows 8 to 8.1 free? Windows 8.1 free update compressed download? Free download windows 8.1 pro 64-32 bit full version free download? Window 8.1 enterprise download compress file? Update to windows 8.1 from windows 8? Widoss 8 users upgrade to windows 8.1 free? Window 8 (Eight) Highly Compressed 2014 Download? A free update windows 8 to 8.1 on a computer? Windows 8.1 highly compressed zip free download? Free upgrade from windows 8 to 8.1? Update to Windows 8.1 for free? Update windows 8 to windows 8.1 for samsung omnia? Download windows 8.1 update compressed? Windows 8 to 8.1 upgrader compressed file free download? How to install windows 8.1 on omnia w? Windows 8.1 free download zip file? Desktop gadgets software windows 8.1free download? Update to windows 8.1 free? Upgrading windows 8 to 8.1 for free? Ms windows store windows upgrade? Windows 8 free upgrade to win 8.1? Update from windows xp to windows 8.1 free? Compress windows 8.1 zip full download? Windows 8.1 activate softwar free download.com/? Windows 8.1 update free compressed download? Free Update to Windows 8.1? Free update windows 8 to 8.1 download? Windows 8 to 8.1 free upgrade? Update Windows 8 to free Windows 8.1? Download Free Windows 8.1 Upgrade? Upgrade from windows 8 to windows 8.1? Fee upgrade from windows 8 to windows 8.1? Free windows upgrade 8 1 update? WIN8 PRO oem win8.1 update image? Download windows 8.1 update from windows 8? Windows 8.1 Free Upgrade Download? Update to windows 8 free? Windows 8.1 update for free? Windows free upgrade to 8.1? Update windows 8 to 8.1 free download? Updte windows 8 to 8.1 online? Free upgrade to windows 8.1? Update windows 8 to 8.1? How to install windows 8.1 in omnia w? Update windows 8 to 8.1 download? Update windows 8 to 8.1 for free? Windows 8,1 apdate to windows 8 free? Winows 8.1 free upgrade from windows 8? Upgrade to windows 8.1 free? Free yodate to 8.1 windows?